The fallout over the school flexibility bill slowed both houses of the legislature last week. And sometimes, that is a good thing. Especially when you have a bill like HB181, which would dramatically lower fees for dumping hazardous waste in the state, poised for a vote by the House. Originally scheduled for March 5, it was rescheduled for Thursday of last week. Then it has been pushed off until this week. The bill is back on the calendar for Tuesday of this week. A waste management professional has analyzed the original bill against current statutes. 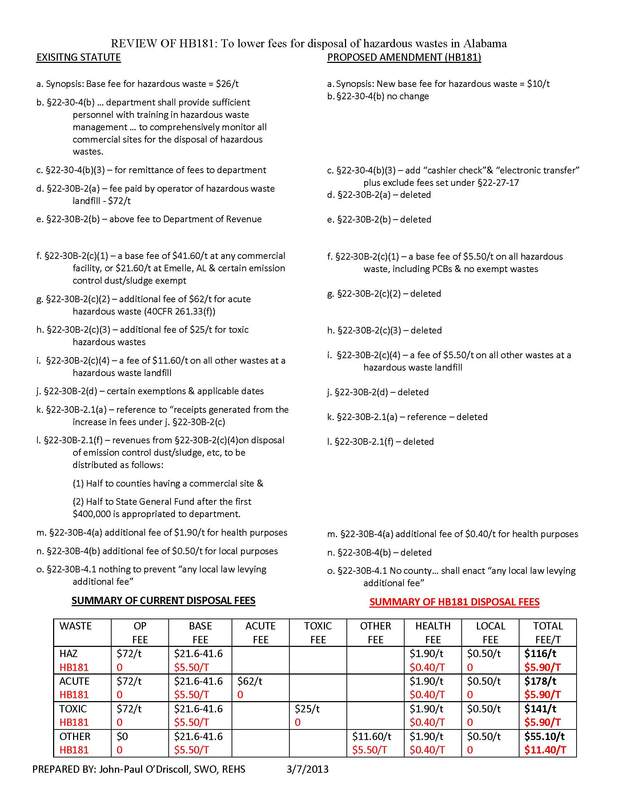 You can see through the chart, overall hazardous waste fees would be cut more than 90 percent if this bill passes. The Alabama Department of Environmental Management successfully got a House committee to adopt a substitute bill, which restores $1 per ton of fees to support ADEM’s hazardous waste program. However, local governments in Sumter County aren’t as lucky. Not only has the local fee of $0.50/ton been removed, HB181 also prohibits local governments from leveeing a fee on hazardous waste. There is still time to tell your House member “Don’t Dump on AL” and to vote NO on HB181 by visiting the Conservation Alabama Action Center. New this week is a bill introduced by Sen. Paul Sanford to redirect any money received from oil spill settlements to go to repay the Alabama Trust Fund. Sanford is from Madison County and is proposing taking away money from affected coastal communities and potential restoration projects to replace the funds that Alabamians authorized being taking out of the Trust Fund in September to make up for budget shortfalls. You can expect representatives from south Alabama will have something to say about this bill.